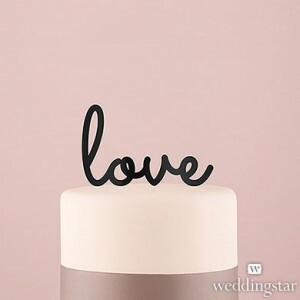 I love this cake topper because it is so simple and yet it would work on just about any cake design you choose. It comes in two colors so you can decide what will work best with your cake colors. I’m a big fan of modern cake toppers and would much rather see something lovely like this ‘love’ topper than anything else. Except maybe a small bunch of fresh flowers. I love flowers on a cake too! And since we’re getting closer to Valentine’s Day, this is the perfect cake topper for the season! You can find this ‘love’ cake topper here. It is available in black or white.